Although DGFC is located in the Kinabatangan Floodplain, our influence is state wide and thus we have also a main office inside the Head Quarters of the Sabah Wildlife Department (SWD) in Kota Kinabalu, and we are also co-managing the SWD’s Wildlife Health, Genetic and Forensic Laboratory in Kampung Potuki. The Malaysian state of Sabah is located on the northern portion of Borneo, the world’s third largest island. Sabah covers an area of about 76,000km2 and shares the island with the Malaysian state of Sarawak, the State of Brunei Darussalam and the Indonesian provinces of Kalimantan. 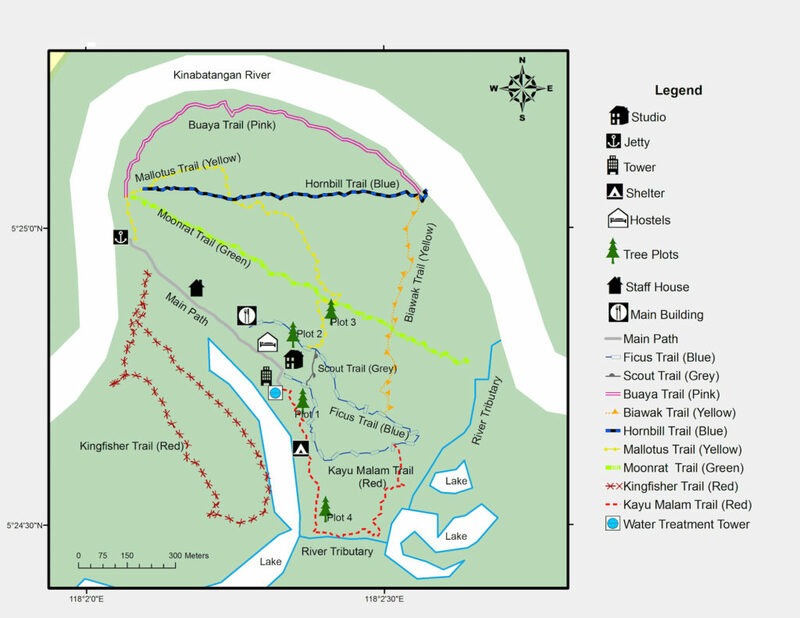 The base camp, Danau Girang Field Centre (DGFC), is located in eastern Sabah, in the Lower Kinabatangan Wildlife Sanctuary. The Sanctuary lies along the Kinabatangan River, the longest river in Sabah, at 560 km. The Kinabatangan River is a widely meandering river, and now has about 30 oxbow lakes scattered along it. Due to its high levels of biodiversity, these wetlands are one of the most important and productive in Malaysia. 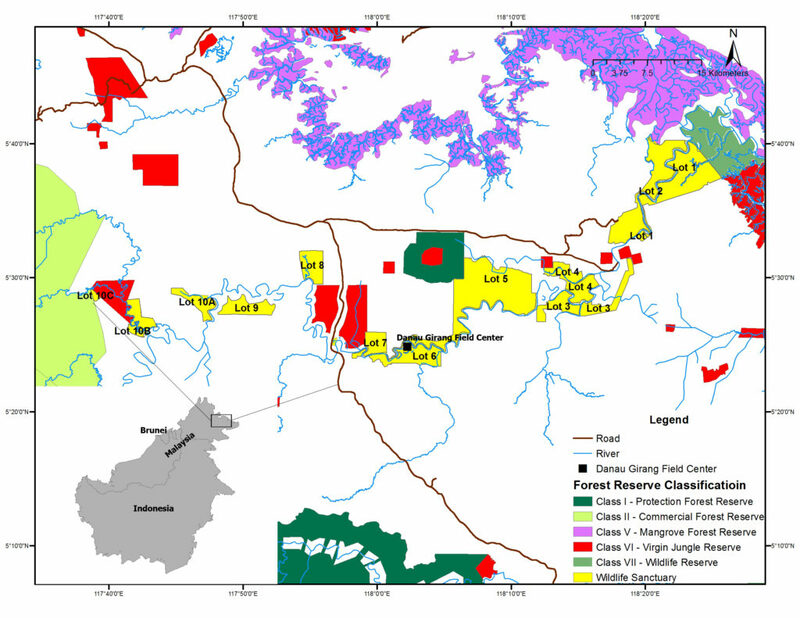 The Lower Kinabatangan Wildlife Sanctuary (LKWS) consists of 10 forest blocks along the Kinabatangan River, totalling about 26,000 ha, and creates a link between the forest reserves already along the river (approximately 15,000 ha) and state and privately owned land (approximately 10,000 ha). The forest types represented include lowland dipterocarp forest, forest over limestone, seasonal and tidal swamps, permanent freshwater swamp, and mangroves. These forest types are located within a landscape with significant human impact, including villages, small scale agriculture and oil palm plantations. Other relevant features include the world famous Gomantong cave system, where edible nest swiftlets and bat roosts can potentially be studied, which is an example of the limestone karst system – a strong feature of the landscape in the Kinabatangan floodplain. This matrix landscape is ideal for investigating the influence and interaction of human encroachment on the diversity, behaviour and abundance of the local wildlife. Herpetofauna is also abundant including the salt water crocodile, monitor lizard, freshwater terrapin, reticulated python, king cobra and many others. To exploit the research activities, the field centre provides accommodation for a maximum of 60 people, catering, and other facilities contained in three main buildings. This is the permanent home of the manager, research assistants and housekeeping staff, as well as of various students and volunteers. Two offices for up to 16 long and short term scientists. Dining area with seating capacity for about 40 people and a fully-equipped kitchen (self-catering is not allowed). Self-catering is not allowed but three self-service buffet style meals are provided each day. Hot drinks and water are provided free of charge at all times. We aim to cater for visitors with allergies and special dietary requirements, please inform us in advance of your stay. Breakfast: Continental style buffet of bread, cereal, condiments, coffee, tea and juice. Lunch and dinner: Malaysian style and typically include meat, local fish and vegetables with rice or noodles. The hostel has a sitting area where students and guests can relax. All windows and doors are enclosed with mosquito netting. Dormitories: capacity for 30 people (two bunk beds and one single bed in each room – maximum five persons per room). Bathroom and toilet facilities: shared (four individual showers and four individual toilets). Our four individual studios are primarily intended for long-term scientists, students and volunteers. Each studio has a shared sitting area with a desk and chairs. A washing machine is available for long-term students and scientists. Our main administration office is located in Wisma Muis, within the Sabah Wildlife Department. The two offices house our GIS resources, a small library and an array of IT services. It is the base of DGFC’s director and of the administrator, the education, and the conservation planning officers. The Wildlife Health, Genetic and Forensic laboratory (WHGFL) is a joint initiative between the Sabah Wildlife Department, EcoHealth Alliance and Danau Girang Field Centre. It is a Bio-Security Level 2 (BSL-2) laboratory, certified to the USA’s National Institutes of Health (NIH) and the Centres for Disease Control (CDC) standards. With funding provided by EHA and the USAID Emerging Pandemic Threats (EPT) Program, SWD and DGFC, the three institutions have established a state-of-the-art facility, which enables wildlife health monitoring, population/conservation genetics research, and wildlife forensic work. The facility benefits conservation and land use planning for a better management of Sabah’s landscape; both agricultural and forest. Since it’s opening on December 2013, the “Lab” has become repository of precious wildlife samples. Currently there are almost 4000 samples from wild animals, collected through SWD and/or DGFC projects, plus over 18,000 samples collected by EHA’s projects alone. These samples belong to a number of species including Bornean elephant, proboscis monkey, clouded leopard, orangutan, common palm civet, crocodile, Malay civet, masked palm civet, pig-tailed and long-tailed macaques, reticulated python, small toothed palm civet, Sumatran rhinoceros, sun bear and tarsier. Most of these samples are from blood or faeces, but many are tissues from different organs from different species. All samples are useful for genetic studies and some of them are useful for health and ecotoxicology screening. The WGHFL has run a variety of projects becoming also a training facility for Sabahans and foreigners alike. Zoonotic disease diagnosis and population genetics are the main areas developed in the WHGFL. However, it is one of the goals of the lab to assist the SWD’s Wildlife Enforcement Division in analysing the confiscated illegal bushmeat and other items of wildlife nature, to determine species and origin. Because of the importance of forensic investigation for Sabah’s wildlife enforcement efforts to combat illegal hunting and trade, DGFC and EHA plan to assist SWD in certifying the WHGFL for forensic work. DGFC’s scientific advisor, molecular biologist and the population geneticists (junior and senior ) are based there.